If Edward Gorey could see the diverse and unpredictable directions his legacy has taken, he’d be most amazed by the Edwardian Ball. 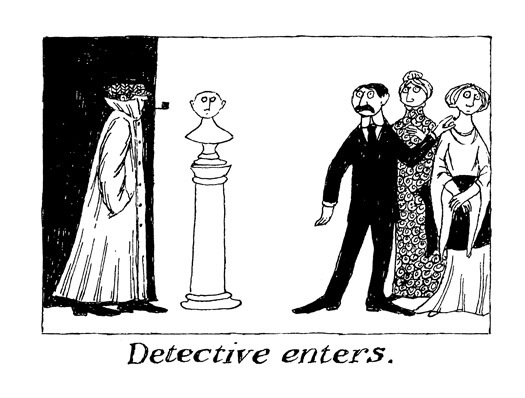 Every January, a month before Gorey’s birthday, fans and steampunk fashionistas in San Francisco and Los Angeles gather to celebrate this New England artist’s tongue-in-cheek depiction of the dark side of Agatha Christie’s Britain. Ironic? Edward Gorey visited California just once, on leave from his U.S. Army posting in Utah, to meet up in San Francisco with his Chicago friend Consuelo Joerns, a student at Mills College. He never set foot in Britain except for a single foray to the Hebrides. He did write a fan letter to Agatha Christie, and framed her reply. But once he moved into his sprawling antique home on Cape Cod, it was a challenge to lure him even to Providence or Boston. After Friday night’s global adventure, we return to The Grand Ballroom for the most decadent night of our season! 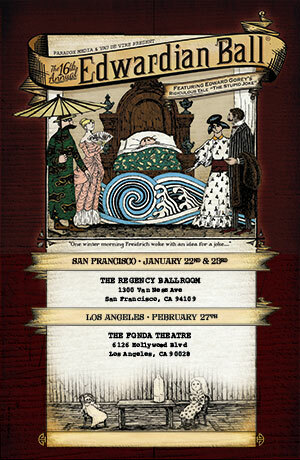 This is the night that started it all, The Edwardian Ball, presented by co-hosts Rosin Coven and Vau de Vire Society. And in the spirit of celebrating all things Edward Gorey, Ball co-hosts The Vau de Vire Society present a series of vignettes throughout the evening paying homage to the most controversial works of the (in)famous illustrator…guaranteed to pop corsets and ruffle coat-tails! solve a murder with anagrammatic sleuth Edgar Rowdey in CJ Verburg’s 5-star Cape Cod mystery Croaked.